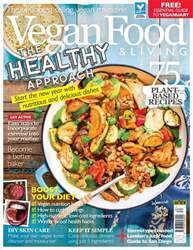 Digital Subscriptions > Vegan Food & Living Magazine > Jan 2019 > What’s REALLY behind YOUR cravings? Dr. Doug Lisle’s Pleasure Trap goes into great detail about what actually happens to our brains when we want the bad stuff (or typically the bad stuff). In a nutshell, every time we feel good from an experience or something we’ve consumed, new connections form in the brain asking for more. Just think of the thousands of chocolate-wanting neurons begging for more! Also, our minds are designed to put in the least amount of eff ort for the biggest pleasure response. This definitely worked to our advantage before the agricultural age, when we foraged (and hunted) for food. We ate what we needed to survive. But now that we have easy access to way more food, and a big chunk of it is incredibly unhealthy, this primal instinct is slowly (or quickly) killing us. This chemical makeup in our brains can make us dependent on a whole host of things: sugar, salt, caff eine, or booze.